Late paintings of Rembrandt van Rijn (1606–1669) offer intriguing problems for both art historians and conservation scientists. In the research presented here, the key question addressed is whether observed stylistic differences in paint handling can be correlated with material differences. In Saul and David, in the collection of the Royal Picture Gallery Mauritshuis in The Hague, NL, the stylistic differences between the loose brushwork of Saul’s cloak and the more detailed depiction of his turban and the figure of David have been associated with at least two painting stages since the late 1960s, but the attribution of each stage has been debated in the art historical literature. Stylistic evaluation of the paint handling in the two stages, based on magnified surface examination, is further described here. One of the research goals was to determine whether the stylistic differences could be further differentiated with macroscale and microscale methods of material analysis. To address this, selected areas of the painting having pronounced stylistic differences were investigated with two macroscopic chemical imaging methods, X-ray fluorescence and reflectance imaging spectroscopies. The pigments used were identified and their spatial distribution was mapped. The mapping results show that the passages rendered in more detail and associated stylistically with the first painting stage, such as the orange-red color of David’s garment or the Greek key design in Saul’s turban, were painted with predominately red ochre mixed with vermilion. The regions of loose, bold brushwork, such as the orange-red slashing strokes in the interior of Saul’s cloak, associated with the second painting stage, were painted with predominately red ochre without vermilion. These macroscale imaging results were confirmed and extended with scanning electron microscopy with energy-dispersive X-ray spectroscopy (SEM–EDX) analysis of three cross-sections taken from regions of stylistic differences associated with the two painting stages, including one sample each from the right and left sleeve of David, and one from the interior of Saul’s cloak. 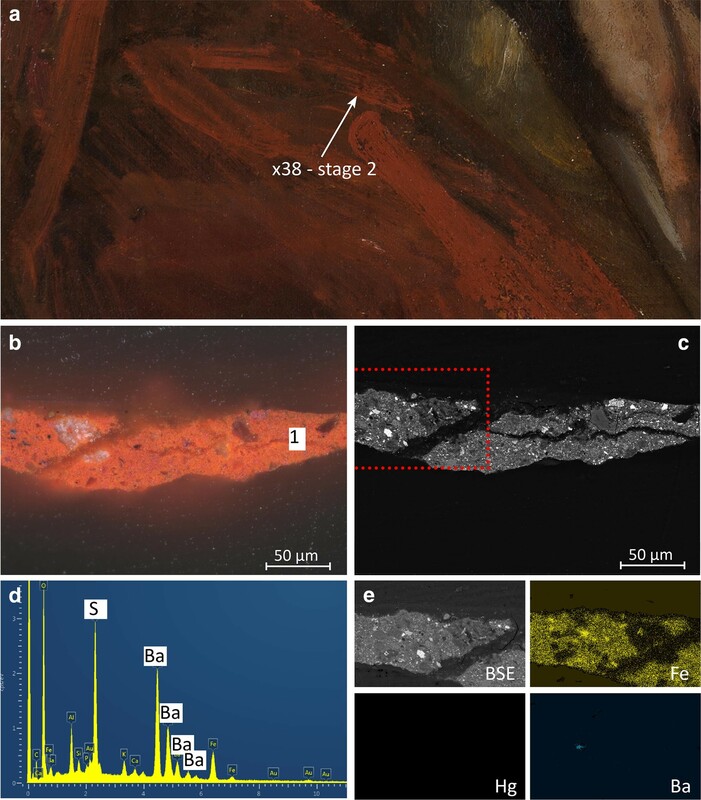 SEM–EDX also identified a trace component, barium sulfate, associated with the red ochre of the second stage revisions. Combining mapping information from two spectroscopic imaging methods with localized information from microscopic samples has clearly shown that the stylistic differences observed in the paint handling are affiliated with differences in the chemical composition of the paints. The late paintings of Rembrandt van Rijn (1606–1669), with bold, suggestive brushwork, are among the most admired works of the Dutch seventeenth century. Saul and David (Fig. 1) depicts the Old Testament narrative in which the king, consumed by jealousy, listens to David playing the harp moments before hurling his spear at the young musician. This work has long been regarded as one of the gems in the collection of the Royal Picture Gallery Mauritshuis in The Hague. However, art historians have disagreed on the attribution of Rembrandt’s authorship. In 1969, the art historian Horst Gerson shocked the art world when he reattributed Saul and David to an anonymous pupil or pupils in Rembrandt’s workshop, working after a design by the master. In coming to this conclusion, Gerson pointed out discrepancies of style between the loose brushwork of Saul’s clothing and the more detailed depiction of his turban and the figure of David . Generations of art historians, such as Gerson, visually evaluated artistic style, distinguishing subtle differences between works of art using only the naked eye. More recently, the practice of assigning authorship has been enriched by methods of technical study, a practice sometimes called “technical art history,” which combines both stylistic and material analysis . Traditional stylistic analysis is enriched by X-ray radiography and infrared reflectance imaging, which can reveal early stages of the creative process and artists’ changes (pentimenti). In addition, by examining the surface with magnification (typically up to 50× using a stereomicroscope), it is possible to identify the order in which the paint layers were applied as well as characteristic aspects of the artist’s paint application, or brushwork. Methods for the investigation of artists’ materials can include analysis of microscopic paint samples from discrete locations on the painting to identify the local chemical composition. Some samples, such as paint cross sections, also give information about the layer structure of the painting. Such combined art historical and technical research was first applied to Saul and David by De Vries et al. in 1978 . 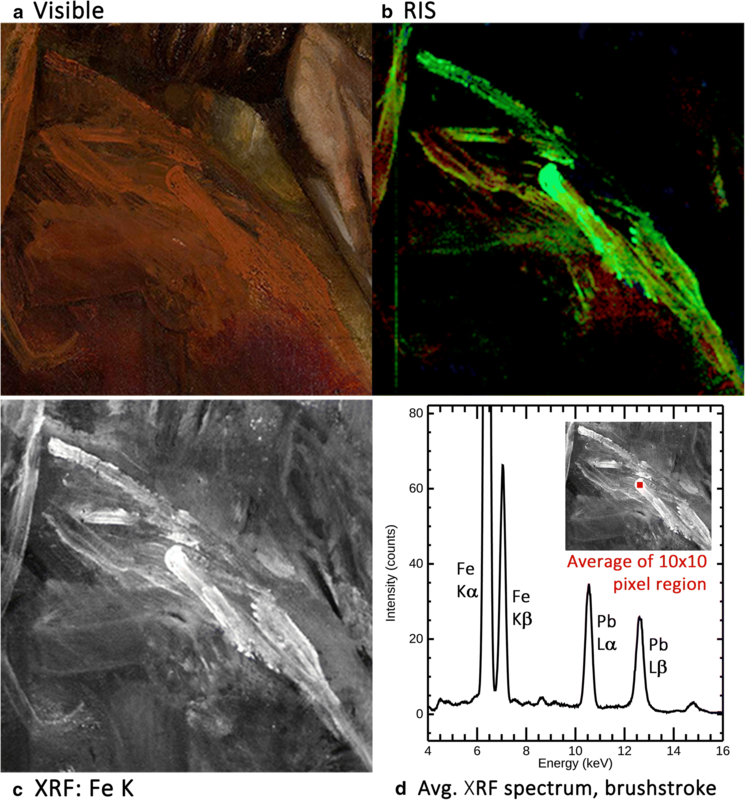 In addition to visual analysis this study used X-radiography, infrared photography (~ 700 to 900 nm), magnified examination of the paint surface, and microscopic and wet-chemical analysis of pigment samples to characterize regions of the painting exhibiting stylistic differences. De Vries et al. examined the sequence of paint layers with a stereomicroscope and concluded that the painting was carried out in two distinct campaigns, or stages . Like Gerson, they also distinguished between the figure of David and what they described as “rather wild strokes of paint across Saul’s thigh.” Their innovative approach, combining visual and technical evaluation of the stylistic inconsistencies in the picture, convinced them that the painting was executed in two stages, painted some years apart by Rembrandt himself. They proposed that Rembrandt completed most of the work—including the turban and the figure of David—around 1655, and that he later revised some areas—particularly Saul’s cloak—between 1660 and 1665 using rough brushwork typically seen in paintings from his late period. The attribution of Saul and David has continued to be a source of debate, however. Since the 1978 study, there has been scholarly consensus that the work was painted in two stages, and that the handling of paint in the turban and the figure of David is distinctly different than the rough brushwork in Saul’s cloak. But scholars continue to reach diverse conclusions on the authorship of the painting, based on differing interpretations of painting style. Some art historians have expressed support for Rembrandt’s authorship of both stages, though there is disagreement on the dates assigned to the two stages: Seymour Slive followed de Vries’ dating, Ernst van de Wetering proposed a first stage c. 1645 and a second stage c. 1652, while Emilie Gordenker dates the two stages c. 1651–1654 and c. 1655–1658 [4–7]. Others believe both stages to be the work of Rembrandt pupils [8–10]. It has also been suggested that a pupil began the work but that Rembrandt “contributed to the final result,” presumably by painting the second-stage revisions . Macroscale chemical imaging, based on non-invasive spectroscopic techniques, has expanded the material analysis methods used in technical art history for areas as large as an entire painting. Non-invasive spectroscopic methods, such as diffuse reflectance spectroscopy in the visible-to-near-infrared spectral region and X-ray fluorescence (XRF) spectroscopy, do not require taking a sample. Diffuse reflectance spectroscopy can be used to identify many inorganic and organic artists’ materials, including pigments and binding media. Electronic transitions related to the color of materials occur in the visible spectral region, and vibrational transitions related to molecular functional groups occur in the near infrared (NIR) and mid-IR spectral region. XRF is an elemental spectroscopic technique that can be used to infer the presence of inorganic pigments based on the elements that are detected. These methods can be executed either as site-specific, point-based measurements or as imaging measurements. In imaging mode, these methods can be implemented such that they yield information about the materials used over the entire painting. Spectroscopic imaging results in a three-dimensional dataset, or image cube, that contains 2-D spatial information and 1-D spectral data. 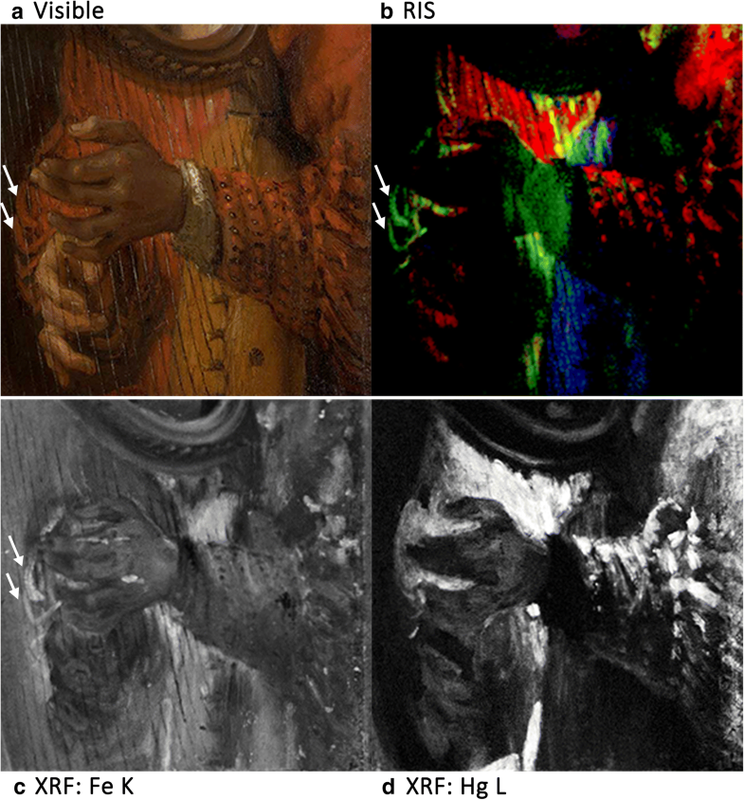 An advantage to these spectroscopic imaging methods, by comparison with point-based measurements (with or without sampling), is that the data generated can be analyzed to produce material maps that permit visual interpretation analogous to visual inspections of paintings by art historians and conservators, facilitating interdisciplinary collaboration. However, in contrast to paint cross-section samples, these imaging techniques provide little information about the paint layering structure. While broadband infrared reflectance imaging (i.e. infrared reflectography) has been widely used for decades to detect the presence of underdrawings or to better understand pentimenti, diffuse reflectance imaging spectroscopy (RIS) and XRF imaging spectroscopy (MA-XRF) have more recently been used to chemically identify and map artists’ materials [12–18] and to visualize earlier painted compositions hidden below the surface [19–23]. Findings of this type may result in re-thinking the art historical understanding of the development of a work of art. Because both the complex material history of Saul and David and the layers of discolored varnish and old restorations that obscured the original paint have contributed to continuing disagreements about its authorship and condition, a new technical study was initiated at the Mauritshuis in 2007. This technical study led by Petria Noble revealed information about the paint layering structure, the pigments used, the authenticity of the curtain, and the original format of the painting [24–26]. These new results supported the decision to undertake the restoration of the painting, carried out from 2012 to 2015. From 2012 to 2018, collaborative research supported by the Netherlands Organization for Scientific Research (NWO, The Hague) and the National Science Foundation (NSF, Washington DC) brought together complementary techniques to study the painting, including additional microscopic paint analysis, RIS, and new MA-XRF measurements. In 2015 the Mauritshuis first presented preliminary findings of the technical research in an exhibition focused on the research and conservation treatment of Saul and David . Scholarly discussion of the attribution has continued. The Mauritshuis concluded that the newly conserved work was painted by Rembrandt alone: that he initiated the painting but then set it aside, returning at a later date to complete his work. This view was presented by Ernst van de Wetering and Emilie Gordenker in a video produced for the exhibition. However, in this exhibition video the museum also presented an alternative opinion by Melanie Gifford that Rembrandt planned the composition and painted the first stages, while another artist in his workshop completed the unfinished work some years later. An important goal of the current collaborative research was whether the divergent interpretations raised by the stylistic differences (proposed already by Gerson in 1969) could be separated by material differences. A recent publication resulting from this collaboration focused on the use of the blue glass pigment, smalt, in Saul and David. This study concluded that the use of two different formulations of smalt was localized in distinct regions of Saul’s turban and his cloak, consistent with differences in painting style previously noted in these two regions . Because stylistic differences are most pronounced in red areas of the painting, the primary focus of the current paper is on material differences identified in these regions. The paints in Saul and David are investigated with macroscale reflectance (400–2350 nm) and XRF imaging spectroscopies and with light microscopy and scanning electron microscopy with energy-dispersive X-ray spectroscopy (SEM–EDX) of paint cross sections, in conjunction with stylistic evaluation of paint handling based on magnified surface examination. This paper compares and contrasts macroscale methods and relates their findings to microscale techniques. For that reason, the discussion is organized around each of the methods: surface examination of paint handling, RIS, MA-XRF, and cross-sectional analysis. Reflectance image cubes were collected as described in Janssens et al. . Briefly, a portable hyperspectral camera (Surface Optics Company, USA) with dual channel detectors [electron multiplying charge coupled device for the visible-to-near-infrared (VNIR), 400–1000 nm, and an InSb focal plane array for the short wave infrared (SWIR), 1000–2350 nm] was used for reflectance imaging spectroscopy (RIS) measurements. Image cubes were collected using an integration time of 10 and 200 ms per spatial line for the VNIR and SWIR channels, respectively. The scan time for each image cube was ~ 5 min (~ 60 min for 12 total image cubes). The painting was diffusely illuminated at ± 45° to the surface normal by three 50 W 4700 K Solux lamps (Tailored Lighting, Inc., NY) and 1 tungsten-halogen lamp (eight lamps total) providing ~ 3000 lux at the painting surface. Image processing and analysis of the VNIR and SWIR image cubes began with flat fielding using a dark image cube and an image cube of a Spectralon (Labsphere, NH) white panel to correct for the dark offset and non-uniform illumination of the painting, as well as to convert to apparent reflectance. The resulting calibrated image cubes were then mosaicked and spatially registered to a high-resolution color image using a previously described algorithm written in Matlab (2012b, MathWorks, MA) . Small black and white spectralon in-scene standards were used to further improve the calibration using the empirical line calibration routine in ENVI (Exelis, USA). The calibrated image cube was analyzed to identify the basis set of spectra, or endmember spectra, that describe the yellow and orange-red areas. The map of where these endmembers were found was made using the mixed tuned match filter (MTMF) algorithm in ENVI. This algorithm is a modified match tune filter and only the spectral region from 450 to 950 nm was used in the analysis. In the maps shown, the limits that define the match were not changed, but the gamma term was increased to two to make the matches in lower-contrast areas more apparent. Identification of the pigments in the endmember spectra was done by comparison with in-house libraries, derivative spectra of point-based reflectance spectra taken in these areas, as well as identifying spectral features reported in the literature. XRF image cubes were collected and analyzed, as described in Janssens et al. . Briefly, a self-built macro-XRF scanner, utilizing a 50 W molybdenum X-ray tube, operated at 50 kV and 1 mA, with a fixed polycapillary lens and four energy dispersive X-ray detectors, was used to scan the painting at a step size of 1 mm and an integration time of 0.2 s per pixel with up to 1.9 s per pixel for areas of enhanced interest . The resulting XRF image cubes were processed by Datamuncher software , PyMCA  and other in-house written software to produce elemental distribution maps of peak area. The maps were stretched from the minimum to maximum values depending on the detected count level for a particular element, and then the gamma term was increased to make areas of lower concentration more apparent. The presence of pigments was inferred from the elements detected. The entire paint surface of the painting was examined up to 40× magnification using a Zeiss Universal S2 stereo-microscope to characterize the brushwork and painting sequence. Microscopic paint samples were collected from three areas of orange-red paint in order to investigate observed stylistic differences. The paint samples were embedded in Technovit 2000 LC mounting resin (Heraeus Kulzer GmbH, Germany) and polished using a sample holder and Micromesh sheets up to grade 12000 (Micro-Surface Finishing Products Inc., Wilton, Iowa, USA) . A Leica DM2500 light microscope was used to analyze the polished cross sections. Light microscopic images of the cross sections were taken using a Zeiss Axio Imager.A2m microscope equipped with a Zeiss AxioCam MRc5 digital camera. The embedded cross sections were gold coated (3 nm) with a SC7640 sputtercoater (Quorum Technologies, Newhaven, East Sussex, UK) to improve surface conductivity. The samples were analyzed with a FEI Verios 460 high-pressure electron microscope at an accelerating voltage of 20 kV and a beam current of 0.20 mA. The SEM was outfitted with an Oxford EDX system to yield elemental composition of the pigments within the paint layers. The contrast of the EDX maps was adjusted by increasing the gamma term to 2 so a low concentration of particles was more easily visible. Magnified visual examination of Saul and David has characterized differences in paint application that explain the differences in style that have led art historians and researchers to propose that the painting was created in two distinct stages. Study of the paint surface in Saul’s garments reveals several paint layers belonging to the first stage, including parallel back-and-forth paint strokes that expanded the cloak over the arm of the chair, followed by the bold revisions of slashing orange-red paint strokes applied with a wider brush introduced in the second stage (Figs. 2, 6a color detail). The first stage began with the painted sketch and underpaint. This initial design, traces of which are still visible in many areas, defined Saul’s tunic, sleeve, and a cloak hanging at his back with freely sketched lines of black paint and yellow and white impasto highlights, typical for Rembrandt’s practice. At this point, the arm of the chair was fairly developed, as best seen in the false-color reflectance image (Fig. 2). After this preliminary sketch had dried, the forms were refined: the white and yellow in the torso were muted with dull greenish paint and several changes expanded the cloak over Saul’s arm, his leg, and the arm of the chair. Still in the first stage, black paint was used to resketch the cloak on the shoulder and upper arm. Subsequently, this black resketch as well as the yellow and white highlights were scraped down in the sleeve, a red-lake glaze was hastily brushed over most of the cloak, and a mass of parallel back-and-forth strokes in dull red paint defined the fall of fabric across the top part of the arm of the chair (faintly visible in the false-color reflectance image). It is striking that while most of Saul’s garments seem unfinished, other areas of the painting have a more finished appearance. 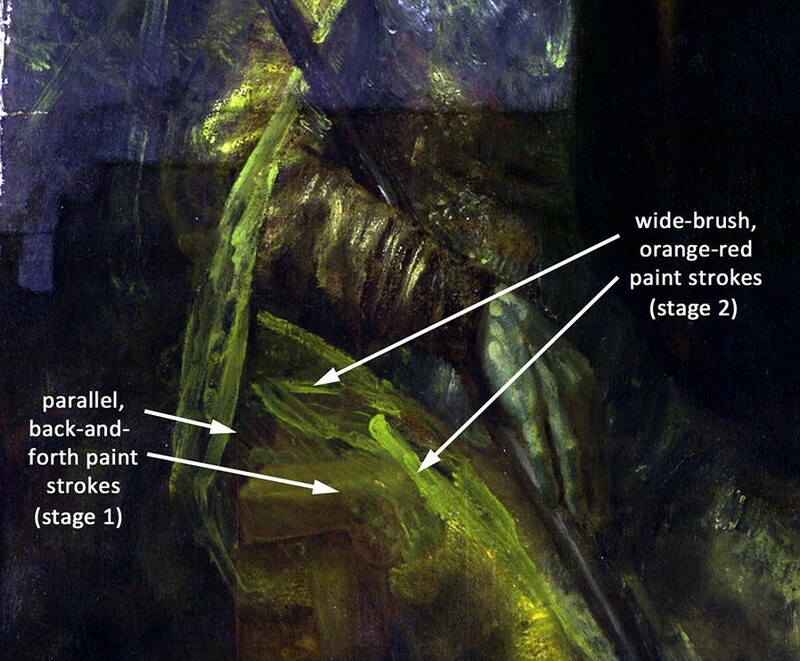 Comparison of the sequence of paint layers throughout the painting suggests that by the end of the first stage of painting these areas, including Saul’s turban and the figure of David, were completed. Saul’s turban was rendered in considerable detail, with a Greek key pattern worked into the complex wrappings. Most of the figure of David playing his harp was brought nearly to completion in the first stage. After this, the painting indeed seems to have been left unfinished for some time. Presumably enough time elapsed that the surface became dry and dull, making it necessary to resaturate the surface of the painting with oil or varnish before work resumed. Some paint cross sections show intermediate (fluorescent) organic layers that support this hypothesis, and such layers have also been found in other paintings by Rembrandt and contemporaries . The second stage is characterized by brushwork of a distinctly different character. Straight lines of paint were applied with a wide brush in Saul’s cloak: opaque yellow and orange-red strokes along the forward edge of the cloak, and a tangle of orange-red strokes that extended the cloak across the arm of the chair and over Saul’s leg (the “wild strokes of paint across Saul’s thigh” noted by De Vries et al.) . The false-color reflectance image in Fig. 2 clearly shows the bold slashing strokes of the second stage. Although these create a vigorous effect on the painting’s surface they do not convincingly suggest the folds in three dimensions. However, they may never have been intended to be fully visible since there is some evidence that they were once covered by a semi-transparent layer of smalt (the blue glass pigment), which apparently was lost in earlier restorations . While David’s costume appears more finished than Saul’s, his orange-red garment shows significant discrepancies of style (Figs. 1, 4a): the brushwork in the complex decoration of his two sleeves is inconsistent. The highlights of his left sleeve convincingly convey the tucked pattern of the fabric, but in his right sleeve, behind the harp, awkward highlights appear to have been added after the harp was painted. Although they have a similar color to the highlights in his left sleeve, these ungainly curved strokes, sometimes painted on top of the harp strings, distract from the foreshortening of David’s arm without evoking the texture or form of the sleeve. These anomalous strokes are reminiscent of the slashed brushwork in Saul’s cloak—with a style that lacks three-dimensionality and also with a similar orange-red color—raising the possibility that these late additions were both painted by the same artist in the second stage using paint that matched the orange-red color of the first stage. In order to gain material insight into the red, orange, and yellow paints used during the evolution of the painting, macroscale chemical imaging was carried out. Red and yellow ochres (iron oxide/oxyhydroxide earth pigments) and vermilion (mercury(II) sulfide) are opaque pigments that were routinely used by Dutch seventeenth-century painters, including Rembrandt. A resulting map of pigment distributions and related spectra from reflectance imaging spectroscopy are shown in Fig. 3. The blue- and green-colored spectra (Fig. 3a) are indicative of yellow ochre and red ochre, respectively. The spectra of ochres generally have a reflectance transition edge between 500 and 600 nm depending on their visible color, with broad absorption bands near 650 and ~ 875 nm for hematite, a red iron oxide, and ~ 950 nm for goethite, a yellow-to-brown iron oxyhydroxide [34, 35]. The reflectance transition edge of the yellow ochre is ~ 545 nm, with a broad absorption centered at 950 nm similar to goethite, and that of the red ochre is ~ 585 nm with a broad absorption centered near 875 nm, indicative of hematite. The areas mapped in Fig. 3b using the blue and green colors assigned to the spectra depict regions of predominately yellow ochre and red ochre. The yellow ochre, a pigment found throughout the painting in both stage 1 and stage 2, maps to the bright yellow highlights in Saul’s turban, tunic, and along the edge of his cloak, as well as the yellow portion of the Greek key design on the turban. Red ochre also is found throughout both stages, but as discussed below, it is present in different pigment mixtures in the two stages. The red ochre maps primarily to the interior edge and slashed brushwork of the revised cloak (second stage) as well as some reddish second-stage revisions to Saul’s turban. The red ochre also maps to portions of David’s garment considered to be added in the second stage, particularly the orange-red highlights added to his right sleeve (seen through the harp). The red-colored spectrum in the plot has spectral features similar to those of the yellow- and red ochre pigments, but the red spectrum also has a comparatively sharper reflectance transition edge at 590 nm, as well as increased reflectance near 900 nm, both of which are suggestive of the additional presence of vermilion. Vermilion has a reflectance transition edge near 590 nm (can range from 585 to 600 nm) and high reflectance at longer wavelengths . The red spectrum is thus likely a mixture of red ochre with vermilion, and maps mainly to regions of David’s garment, thought to be painted in the first stage. Evidence for the pigment differences observed with RIS can also be seen in the MA-XRF element maps. It should be noted that RIS in the visible spectral region detects spectral signatures from pigments predominantly on the surface of the painting, whereas MA-XRF can provide information on both the distribution of elements on the surface of the paint layer and on layers below the surface, depending on the energy range. Iron, for example, may be associated with an initial brown painted sketch in the lower paint layers as well as ochre-containing final paint on the surface; both would appear in MA-XRF images whereas RIS would predominantly detect the ochre surface paint. Visible light images of details from the painting showing regions of orange-red paint associated with the first and second stages are illustrated with the corresponding RIS map and MA-XRF maps for iron (Fe) and mercury (Hg) in Figs. 4, 6, and 8. In the RIS map showing the figure of David playing his harp (Fig. 4b) most of the garment maps to the red-colored spectrum from Fig. 3a, representing a mixture of red ochre and vermilion, including touches of orange-red paint that represent highlights in the tucked pattern of his left sleeve in front of the harp. This mixture of pigments seems to be affiliated with the parts of the composition that Rembrandt completed in the first stage, based on the stylistic evidence. Other additions, such as the ungainly curved highlights added to David’s right sleeve behind the harp, are associated stylistically with the second-stage revisions. These highlights map to the green-colored spectrum, representing primarily red ochre, rather than a mixture of ochre and vermilion. The MA-XRF maps for iron and mercury (Fig. 4c, d) are consistent with the RIS results. While iron is found throughout the composition, there is a relatively higher concentration in the awkward orange-red highlights of David’s right sleeve, presumably added during the second stage. No mercury was detected in these added highlights. However, mercury appears extensively throughout most of the garment and in the tucked highlights of David’s left sleeve, associated stylistically with the first stage. A vertical form at the lower center of Fig. 4 illustrates the value of combining information obtained through RIS and MA-XRF spectroscopy. This shape appears in both the MA-XRF mercury and iron maps (but is seen most intensely in the mercury map), while in the RIS map it maps to the green-colored spectrum representing predominantly red ochre. Because the visible portion of the RIS image cube is sensitive primarily to surface layers, this suggests that the surface paint in this form is red ochre from the second-stage revision, while the mercury seen in the MA-XRF map is in an underlayer not detected with RIS. The presence of vermilion in underlayers also is documented in paint cross sections (described below). The study of microscopic paint cross sections provided independent confirmation and further insight into the RIS and MA-XRF spectroscopic results. Sample locations for paint cross sections were carefully selected to investigate the stylistic differences observed in areas that visually seemed to share a similar orange-red color (Figs. 5a, 7a). Pigments were identified through analysis of morphological characteristics observed with light microscopy and elemental analysis using SEM–EDX. Vermilion was inferred from EDX detection of mercury (Hg) and sulfur (S), whereas red earth from the presence of iron (Fe), silicon (Si), and aluminum (Al). Red and yellow lake pigments were inferred from the co-localization of elements associated with the lake substrate, including Al, potassium (K), and S for red lakes and Al and calcium (Ca) for yellow lakes. Bone black was inferred from the presence of Ca, phosphorous (P), and magnesium (Mg), whereas charcoal black was identified by its morphological characteristics alone. A paint cross section taken from an orange-red brushstroke of David’s left sleeve (sample ×26, Fig. 5c, e) confirms the presence of vermilion in two layers of orange-red paint (layers 3, 4). Because these layers were applied directly on top of the double ground (Fig. 5c, layers 1, 2) they correspond to the first, earliest stage of painting. The lower paint layer (layer 3) contains almost pure vermilion, while in the upper paint layer (layer 4) the vermilion is mixed with red earth, red lake, and charcoal black pigment. This paint cross section appears to be representative of the materials used in the sleeve, as the RIS and MA-XRF maps, described above, show that both red ochre and vermilion were broadly used throughout the tucked pattern of this sleeve. In the paint cross-section taken from an orange-red highlight added to David’s right sleeve behind the harp (sample ×25, Fig. 5b, d), SEM–EDX, like RIS and MA-XRF, found a different paint mixture compared to his left sleeve. Over a trace of the double ground (Fig. 5b, layers 1, 2), the cross section shows several layers of dark brown paint (layers 3, 4, 5) corresponding to the background in the first stage, including bone black and occasional particles of vermilion, red lake, yellow lake, and fine red earth. In this sample the background is followed by a single orange-red paint layer (layer 6) containing predominantly red ochre and a little red lake: the highlight added in the second stage revisions. No vermilion was observed in this layer but, interestingly, SEM–EDX analysis also showed an unexpected trace component, a particle of barium sulfate (EDX: Ba, S). In the orange-red, slashing brushstrokes of Saul’s cloak (Fig. 6a), the RIS, MA-XRF, and paint sample analysis show the orange-red paint is composed of red ochre (and no vermilion), as in the highlights added to David’s right sleeve behind the harp. In the RIS map (Fig. 6b) these broad brushstrokes map to the green-colored spectrum, indicating the presence of predominantly red ochre. MA-XRF shows these brushstrokes contain iron (Fig. 6c) but not mercury (see XRF spectrum in Fig. 6d showing the absence of Hg Lα at 9.98 keV). SEM–EDX analysis of an orange-red paint sample from one of these strokes (sample ×38, Fig. 7) also shows no vermilion; instead it consists of an intimate mixture of red ochre and some red lake, the same materials as in the added highlight of David’s right sleeve. Intriguingly, this paint sample also includes several particles of barium sulfate (Fig. 7d). The orange-red paints used for the highlights added to David’s right sleeve and the slashing brushstrokes in Saul’s cloak, previously associated with the second stage of the painting based only on stylistic evidence, have similar compositions based on the RIS and MA-XRF maps and cross-sectional analysis. This strongly suggests these regions were painted using the same materials. Particles of barium sulfate identified in both paint cross-sections may represent a trace material characteristic of the specific red ochre pigment used. One of the most complex areas of the composition is seen in Fig. 8a. The woven folds of the turban originally included a precise Greek key design associated stylistically with the first stage, painted with interlocking strokes of yellow and orange-red which are still visible. The RIS map (Fig. 8b) distinguishes between yellow and red earths, as the yellow paint in the Greek key design maps to a yellow ochre pigment (mapped in blue) and the orange-red paint maps to a mixture of red ochre with vermilion (mapped in red). The MA-XRF iron and mercury maps confirm these assignments, showing an interlocking pattern of iron and mercury (Fig. 8c, d). Other parts of the turban were probably revised and repainted during the second stage, based on the broad paint handling, including the dull yellow-orange band above the Greek key design. Though this band is not bright red, vermilion can be inferred from the MA-XRF mercury map (Fig. 8d) that shows a “honeycomb” pattern. This pattern is no longer visible on the surface, indicating this region has been revised, and the RIS map shows that this area seems to be covered over with predominately yellow ochre (a dense area in the XRF iron map in Fig. 8c; blue color in RIS map in Fig. 8b). Interdisciplinary research expands the possibilities of art historical interpretation by comparing data from different methodologies. Taken alone, visual interpretation of style is not definitive as the basis for attribution. Similarly, it should be noted that (unless anachronistic materials are identified) material evidence cannot conclusively establish nor disprove authorship. All of the materials identified in Saul and David, including the opaque orange-red pigments red ochre and vermilion, were available to all Dutch seventeenth-century artists, and Rembrandt used both throughout his career. However, when both stylistic and material analysis support the same conclusions, interpretation of artistic style is strengthened. In Saul and David, the two examples of material differences identified to date, including the use of smalt and different red pigment mixtures, are also associated with stylistic differences. Close visual examination of the paint surface, along with chemical imaging described in this paper, is consistent with—and expands on—previous art historical scholarship exploring the two stages in the creation of Saul and David. The first stage of the painting’s creation ranges from a preliminary design (painted sketch) in black with yellow and white highlights, best seen in parts of Saul’s tunic, to finished passages such as the figure of David, which were close to completion when the painting was set aside. The wild brushwork of the second stage of Saul and David—the broadly brushed revisions now visible in Saul’s cloak and David’s right sleeve—can be explained in two different ways: either that an associate of Rembrandt’s used exaggerated slashing strokes to imitate his habit of leaving some underpaint visible in the final image; or that Rembrandt himself reworked the picture by applying exaggerated strokes that were intended to be largely hidden by a paint layer that was later lost in restorations. The material evidence presented in this paper—the localization of two distinct pigment mixtures both used to create a similar orange-red color—is consistent with the stylistic differences identified through visual analysis, and clearly strengthens the hypothesis that Saul and David was executed in two distinct stages over a period of years. The combined results from reflectance and XRF imaging spectroscopies identified and mapped a mixture of predominantly vermilion and red ochre in the parts of the painting that were largely completed in the first stage, David’s orange-red garment and the Greek key design in Saul’s turban. In the second-stage, orange-red revisions to the composition—the slashing brushstrokes on the interior of Saul’s cloak and the awkward highlights on David’s right sleeve—were applied using a paint containing predominantly red ochre without vermilion. 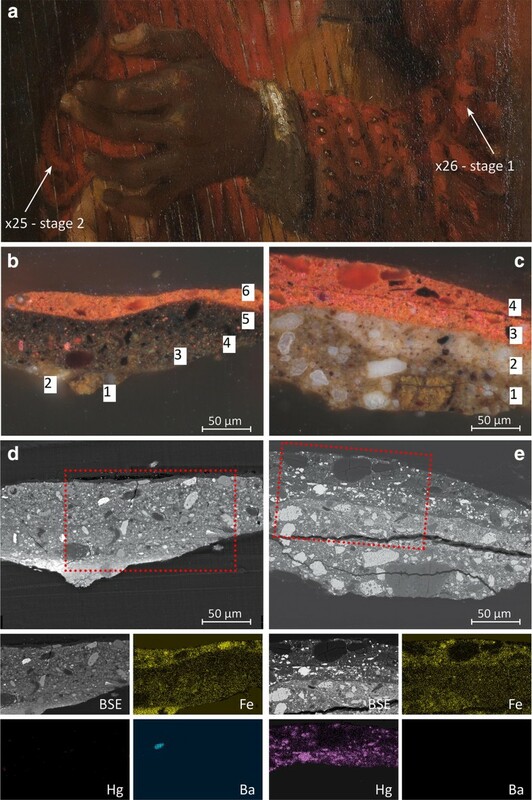 Microscopic paint cross section analysis confirmed the mapping results and also identified distinctive traces of barium sulfate associated with the red ochre used in the second stage revisions. A delay between the two stages of Saul and David would not be unusual for Rembrandt. Not long after his death, Arnold Houbraken (1670–1721) deplored his tendency to leave works unfinished. His biography, based on eye-witness accounts, also describes a few paintings ‘in which some things had been worked out in great detail while the rest, without paying attention to any design, seemed to have been smeared on with a coarse tar-brush’… . 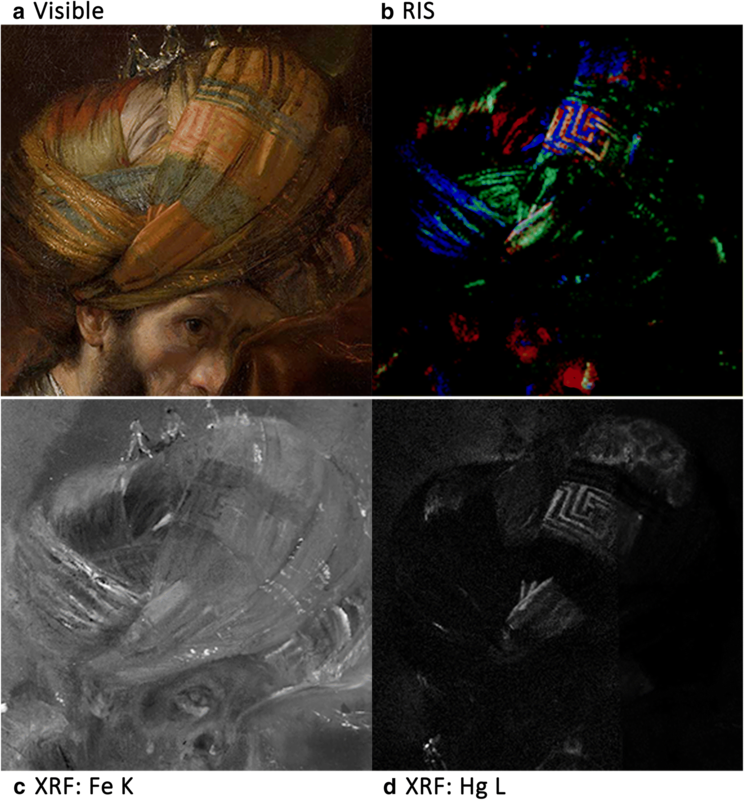 There are examples of unfinished works that Rembrandt himself completed after years had elapsed—such as Susanna Harassed by the Elders (c. 1635–1647; Gemäldegalerie, Staatliche Museen zu Berlin), where technical art history using MA-XRF and neutron activation auto radiography provided new insights [38, 39]. However, there are also works, such as The Apostle Paul (c. 1657; National Gallery of Art, Washington), that seem to have been started by Rembrandt but later completed by associates imitating his painting technique [40, 41]. The material evidence that Saul and David was started with one pigment mixture for the orange-red paints, then completed using a different mixture, would be plausible in either scenario. If an artist habitually used the same mixture of pigments for particular colors, then a different pigment mixture could indicate work by another artist; however, it also would not be surprising for an artist to change their pigment mixtures after a hiatus of some years. 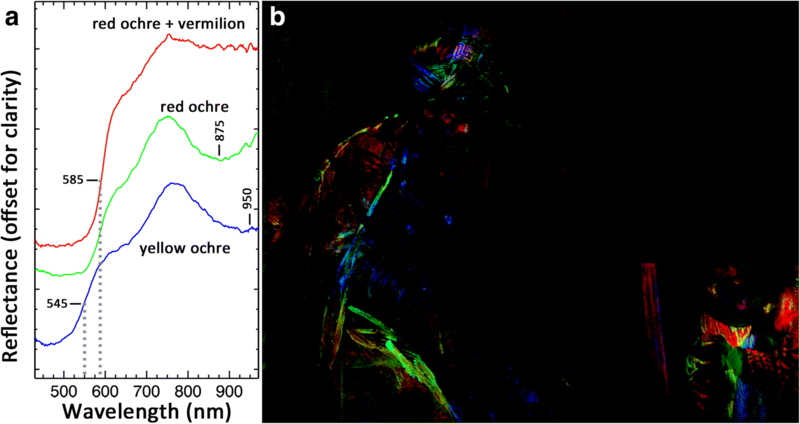 Macroscopic chemical imaging based on reflectance and XRF imaging spectroscopies and microscopic analysis of paint cross-sections detected differences in material composition between the opaque orange-red paints used in Saul’s turban and most of David’s garment (predominately iron ochres with vermilion) as compared with the revisions to Saul’s cloak and the added highlights on David’s right sleeve (predominately red iron ochre with trace barium sulfate). Material differences alone cannot establish authorship; this evidence does not prove that different artists were involved nor, conversely, that Rembrandt used different materials at different points in his career. 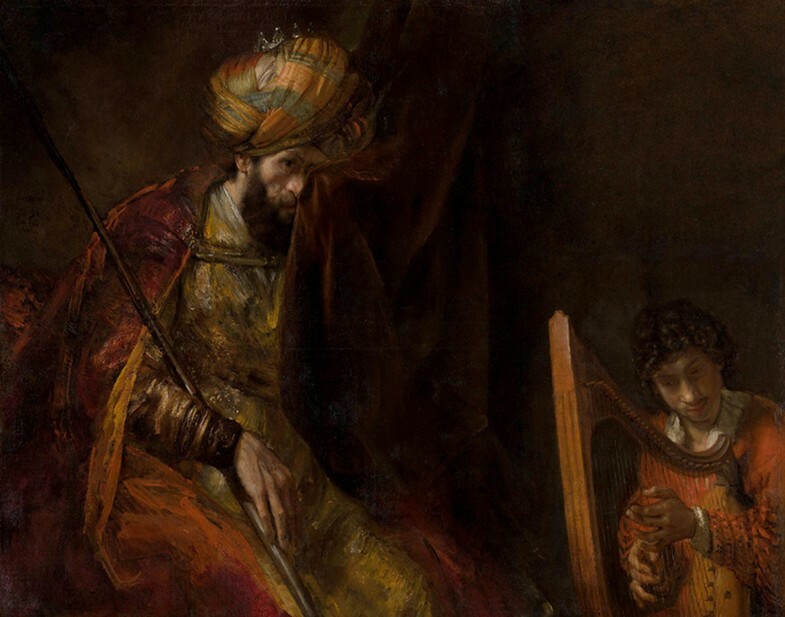 The attribution of Saul and David—either a work begun by Rembrandt and finished by an associate, or an entirely autograph work—therefore remains the subject of scholarly debate. However, these material differences conclusively confirm the hypothesis, previously based only on stylistic differences in paint handling, that Saul and David was painted in two distinct stages. JKD, KAD: collection of RIS data, RIS data processing, drafting manuscript; EMG: evaluation of painting sequence and brushwork style, data interpretation related to Rembrandt’s technique, drafting manuscript; GvdS, MA, SL, KJ, JD: collection of MA-XRF data, MA-XRF data processing; PN, AvL: light microscopic and SEM–EDX paint analysis, evaluation of painting sequence and brushwork style, data interpretation related to Rembrandt’s technique; editing manuscript. DMC: RIS data processing; JGZ: collection of RIS data. All authors read and approved the final manuscript. The authors gratefully acknowledge the novel collaboration between the Netherlands Organisation for Scientific Research (NWO) and the National Science Foundation (NSF) through the NWO Science4Arts program and the NSF SCIART program. We also thank Murray Loew and George Washington University. The authors gratefully acknowledge the financial support through the NWO Science4Arts program (ReVisRembrandt Project 2012–2018) and the NSF SCIART program (Award 1041827). JKD acknowledges support from the Andrew W. Mellon and the Samuel H. Kress Foundations. SL is grateful for a doctoral scholarship from the Research Council of the University of Antwerp. GvdS and KJ acknowledge support from the Fund Baillet Latour. Wheelock Jr. AK. Rembrandt van Rijn, Anonymous Artist/The Apostle Paul/c. 1657. In: Dutch paintings of the seventeenth century. NGA Online Editions. 2016. http://purl.org/nga/collection/artobject/1198. Accessed 08 Sept 2016.